In this excerpt from SFS Pentatonics 2 - Navigating Chord Changes, we study a process of selecting and applying different scale choices, when improvising over 12-bar blues progressions. "When you want to improvise over the chord changes of a song, you must understand that you will be inadvertently very limited, and mechanical in your playing, if you don’t know the chord changes by heart. When you have to look at the lead sheet to see what chord is coming up, and you need to calculate how long to stay on each scale before switching, and so on, inspiration and creativity suffer. Of course, it’s ok to use the key cycles, or even real songs, as exercises and look at the chord changes. It’s a great way to practice. But it’s not the best way to produce inspired music. You see, as you work on a song and learn its harmonic form, at some point you will feel just as comfortable and free as if you were playing a single scale. The key changes become automatic and transparent, and creativity takes over. The first step is to look at the chord changes and determine what scales you want to use. I will do this over a simple dominant blues tune, in G, which is a fairly common key in guitar music. Before we get into it, I need to point out something about blues that you may, or may not already know: You can play the minor pentatonic or blues scale of the key over a blues tune, without following the chord changes, and it will still sound great. This is an example of what we call "harmonic simplification". In fact, many wonderful blues players use this almost exclusively. Now if you look on the surface, you may think that this scale should not sound good, because basically you are playing a minor scale over major chords. But if you look closely, there are harmonic reasons why it works so well. I can’t get into them right now, but maybe I will do a lesson on that in the future. The reason I pointed this out is because for every chord in our Blues in G example, we will have a second scale option, the G minor pentatonic or blues scale. 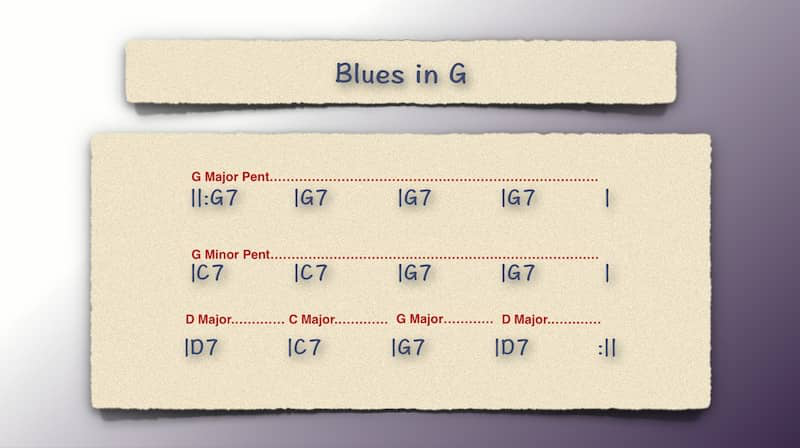 So let’s look at the form of a simple blues in G (look at the pic below). The first 4 bars are G7, so according to what we have learned, the appropriate scale is G major pentatonic. In addition to that, we have the G minor as a second option. For now I will choose the G major. Then we have C7 for 2 bars. Our options here are C major pentatonic, and again G minor. I will choose the C major. Then 2 bars of G7 again, so I will return to the G major pentatonic. The last 4 bars of a 12 bar blues are called the “turnaround”, and in most variations of blues it’s the most harmonically busy section. We have one chord per bar in this case. So let’s say that I’m lazy and want to take the easy road. In that case I choose the G minor pentatonic over all of them. So here’s my plan: 4 bars of G major, 2 bars of C major, 2 bars of G major again, and then 4 bars of G minor. This brings us to our second step. We need to memorize this plan. If you are into theory and understand the functions of these chords, there are different ways that you can label these progressions in order to remember them. But let’s stick to a simple approach: If remembering the whole plan is too much, then break down, and practice in 4 bar sections. You probably don’t need to do that for a blues, but you may need to later when we apply this on a more complex tune, so we’ll talk more about it then. Your job in this step is to put on a backing track, and on the first beat of every bar, play the root and say the name of the scale, without looking at the song lead sheet. It’s important to do this on every bar so that you develop your sense of how the form flows. Keep in mind that the root of the minor pentatonic can sound strange over some chords in the turnaround, but that’s just when you sit on the root for a long time as in this exercise. In the next parts you will hear that the minor pentatonic sounds just fine. Note: In the video example I show you the lead sheet so that you understand what I’m doing, but the point is to do this without looking. So once you can do this by heart, then you can go to the next step. The 3rd step is to play the scale whenever the scale changes. In songs with quicker chord changes you can just play just a part of it, but here we have time to play the whole thing. In the video example I do it first ascending, and then descending, as always without looking at the lead sheet. Note: The examples in this video are played using SFS (String Fragment System) fingerings in a single fretboard area (frets 5-8). Feel free to apply the process to any fingerings you like. So take what I give you and find ways to use it that accommodate your own personal style and character. Whatever you choose to do, remember that this skill requires some time and patience, so don’t give up. 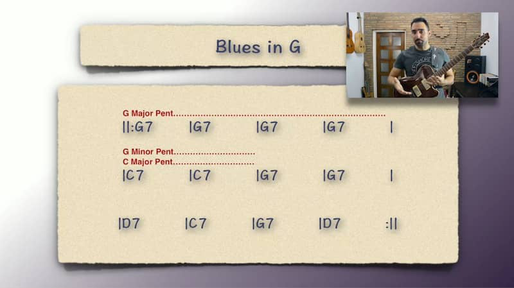 I have included the Blues in G backing track below, for you to practice over, but at the end of the course you will have all the information you need to take this and apply it on any song you want. So have fun and I’ll see you in the next lesson where we will tackle a more involved tune with some different scale requirements."